John, all the way from Ireland, a New Yorker for a decade. Such a New Yorker that he went on a date with a juggling twin and saw Bill Clinton on the same night. Demitri, all the way from Salt Lake City by way of LA in a red convertible. Such a New Yorker, such a Manhattaner, such a West Villager, that he once wondered if above 125th street was in the Bronx. John was my first New York friend. We both had houseguests, our houseguests knew each other and went off to Staten Island on the ferry promising to be back at an appointed time for dinner. They did not come back. An hour passed. John and I each identified the other as the person stood up by a houseguest on the corner of 47 and 7th. We chatted. Later, we ate pizza. And that was that. Demitri was my late night New York friend. Up for 11pm comedy at the Pit? Yes. How about midnight cheesecake? Yes. His last night in the city, we met at Balthazar at 11.30 for wine and fries. That’s the nature of the city, I suppose, people come and people go. And when they leave, they give their stuff to their friends. This is why we are now the proud owners of 2 and a half bottles of limoncello. 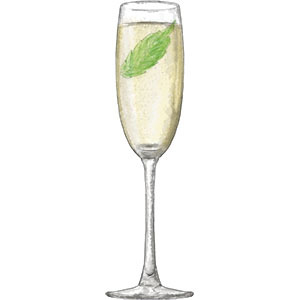 Pour 1 shot of limoncello into a champagne flute. This entry was posted in Uncategorized and tagged adventure, cocktail, limoncello, mint, New York, soda. Bookmark the permalink. I’m also thinking sorbet. Summer is a coming!